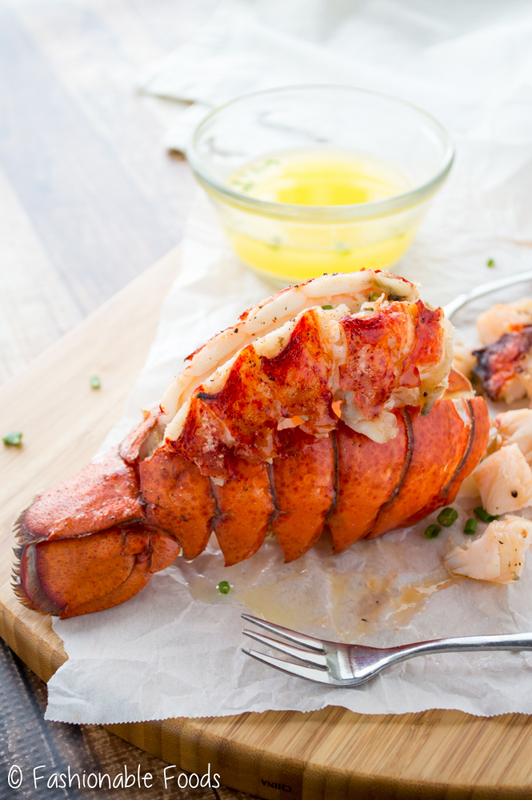 Succulent lobster tails make a wonderful main dish for your New Year’s Eve celebration. These perfect lobster tails are partially steamed to keep them juicy, then they are basted with butter and finished off under the broiler for unbeatable flavor! Hi everyone! I hope you all had a wonderful Christmas if you celebrate! I did. One of the best actually! For once the day didn’t fly by in the blink of an eye. Totally did not intend to rhyme there. Seriously though, it was a nice relaxing day with delicious food and time with family. It was also insanely warm – I wore a tank top for Christmas Eve and for Christmas I had a skirt and tee on and was still sweating! High 60s/low 70s is just insane for northeast PA this time of year! I’m always sad to see Christmas end, but we still have New Year’s Eve & Day! That means lobster! Have you ever made lobster? It’s actually pretty easy to cook up some lobster tails and once you make your own you probably won’t ever order it out in a restaurant. 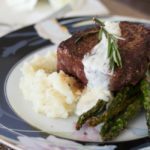 It’s so much cheaper to make your own anyway and you can avoid the crowded restaurants on New Year’s Eve! Fun fact: I’ve never ordered lobster in a restaurant. 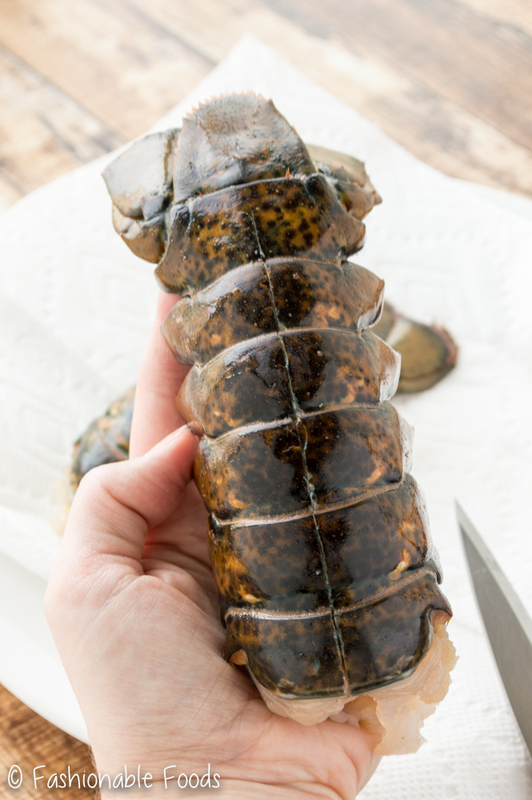 To make perfect lobster tails you’ll steam them until they are just about cooked through, then you’ll baste them with butter and broil them to finish them off. This method makes succulent lobster with amazing flavor. Before I steam the tails, I like to cut the top part of the lobster shell. This helps you to see the progress of the lobster as its cooking and makes it easier to remove once they are cooked. I’ve purchased lobster tails in the past that have already had this step done, so that’s always helpful. It’s really simple to do on your own though! All in all making lobster at home is an easy process – just take your time and you’ll be fine! I like to serve mine with butter for dipping and keep the sides simple – roasted broccoli and baked potatoes. Easy, but super delicious! If you’re looking for something a little fancier to serve for New Year’s Eve, stay tuned for my lobster risotto! Fill a large pot (with a steamer insert) with about an inch of water. Place the steaming basket in, cover, and bring the water to a boil. Meanwhile, take a lobster tail and hold it with the tail part facing away from you. Using kitchen shears cut the top of the shell directly in the middle down to the tail. Make sure you only cut the shell and not into the meat. Repeat with the other lobster tail. Place the lobster tails into the steamer basket and steam for 8-10 minutes, or until the shells begin turning red and the tails just start to curl. Watch closely as you don’t want them to overcook! While the lobsters are steaming preheat the broiler and melt the stick of butter. 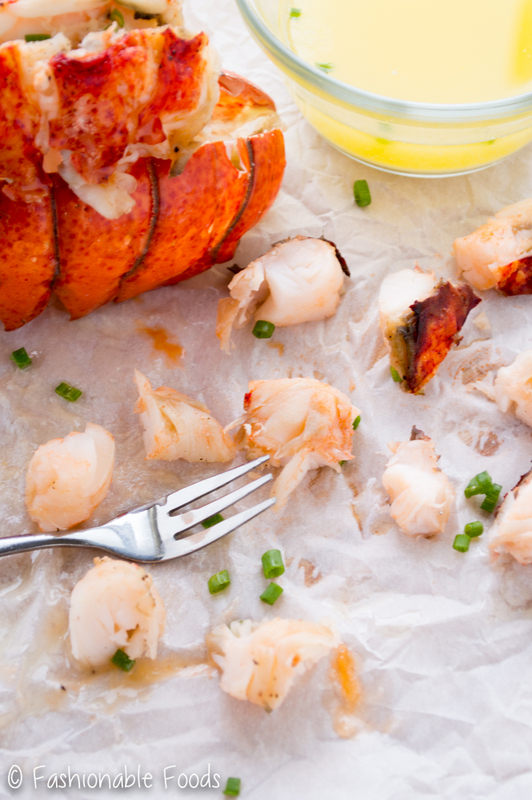 Once the lobsters are ready, remove them from the steamer and place them on a rimmed baking sheet. Let them cool until you can handle them. Flip the lobster over and using your kitchen shears cut the middle part down to the tail, being careful not to cut the meat. You’re repeating the same process as you did with top. Gently pull the meat from the shell, leaving part of it in the tail. Rest the meat on top of the shell and place the lobster back onto the baking sheet. 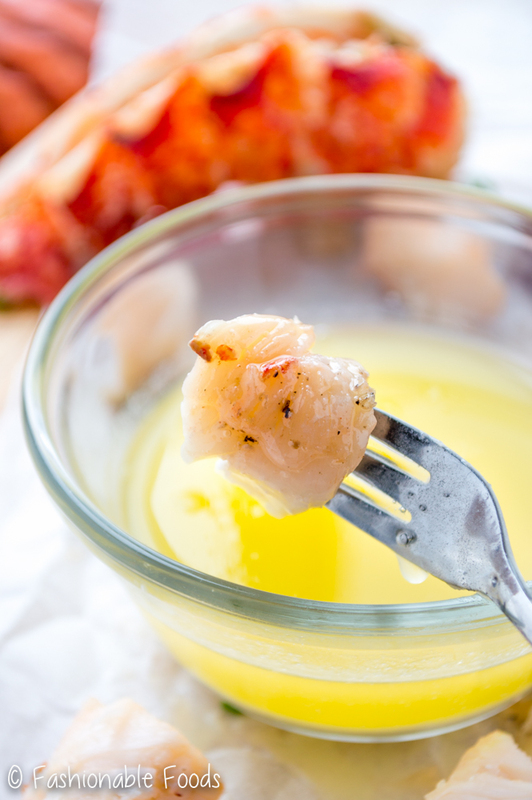 Spoon 1 tablespoon of butter over each lobster tail and season with salt and pepper. Broil the lobster tails for 5-8 minutes, or until the tops are very lightly golden. The timing will vary depending on your broiler, so just keep a close eye on the lobster tails! Serve the lobsters with the remaining butter for dipping. Glad to hear you had a nice Christmas!! These lobster tails look like the perfect way to ring in the new year. I’ve never tried making them at home, but my family has and like you said, they always come out better than in the restaurant. Cheers to NYE! These lobster tails looks awesome! What a delicious feast! I also cook lobster tails at home, I broil them without pre-steaming. Happy New Year! Thank you Melanie! Broiled lobster is my favorite, but I always tend to over cook them! Pre-steaming and then broiling for a few minutes gives the same flavor but I don’t over cook them. Happy New Year!! I’ve never made lobster before but it’s my favorite kind of seafood (next to crab)! And I’ve always wanted to make it on New Years, too! This looks just perfect, Keri. And it’s really not as daunting as I thought! 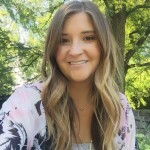 Pinned and can’t wait to try this out! I love crab too, Gayle! 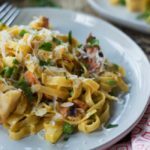 I remember being terrified the first time I made lobster at home, but ended up shocked at just how easy it was! I hope you’ll try it sometime 🙂 Happy New Year! All I can say is WOW! I love some good lobster tails and you make it look even more easy and delicious. Gorgeous photos too! Happy New Year, Keri! Glad the holidays treated you well! It was warm here for Christmas too, but it got colder for NYE. Anyways, YESS to lobster! I actually make it a lot and your method is perfection! Thanks for making me drool and crave lobster at 8 o’clock AM. 😉 Cheers, doll! It got colder here, too! In fact, it’s in the single digits and I’m FREEZING! We were too spoiled with the warm weather! 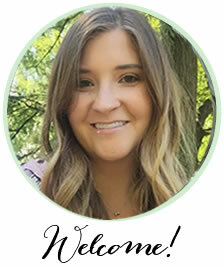 Thanks, Cheyanne – I need to make it more often instead of once a year! It’s so much better to make lobster at home! We do it fairly often, but I have paid outrageous prices and ordered it in restaurants. I think that cutting the shell that way also makes for a prettier presentation – especially for a holiday! These look delicious! Happy New Year, Keri! I’m glad you had a wonderful holiday! It was unseasonably warm here too, but it sure is cold now! I definitely need to start making lobster more instead of just once a year! Thanks, Rachelle! Great easy to follow instructions. Looks like they turned out great! Love the pictures , lobsters look great. My question is most recipes only call out to cut the top and pull meat out,why do you cut the bottom also?Just wondering,thx keep up the good work. I have always wanted to cook lobster at home also. But, I’ve heard that you have to buy them live to cook them. Is that still true? I hope not because that scares me! Hi Shelia! If you’re buying whole lobsters they will be live. However, for this recipe you just need the tails, which makes things less scary ? 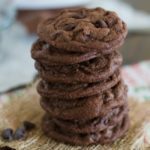 This is my go to recipe…always turn out great, and so simple. Thank you.